This book focuses primarily on continuities and discontinuities of fascist politics as manifested in discourses of post-war European countries. Many traumatic pasts in Europe are linked to the experience of fascist and national-socialist regimes in the 20th century and to related colonial and imperialist expansionist politics. And yet we are again confronted with the emergence, rise and success of extreme right wing political movements, across Europe and beyond, which frequently draw on fascist and national-socialist ideologies, themes, idioms, arguments and lexical items. Post-war taboos have forced such parties, politicians and their electorate to frequently code their exclusionary fascist rhetoric. 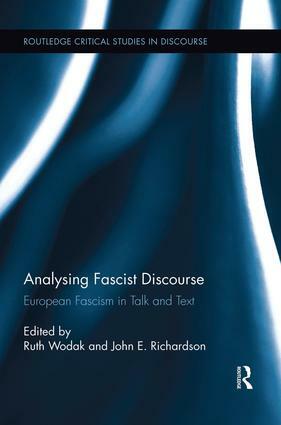 This collection shows that an interdisciplinary critical approach to fascist text and talk—subsuming all instances of meaning-making (oral, visual, written, sounds, etc.) and genres such as policy documents, speeches, school books, media reporting, posters, songs, logos and other symbols—is necessary to deconstruct exclusionary meanings and to confront their inegalitarian political projects.